10/2/87, Scotland County MO. My first deer, taken on the second morning of my first ever deer hunting trip. Double lung & a little liver. He took about 3 bounds and piled up. 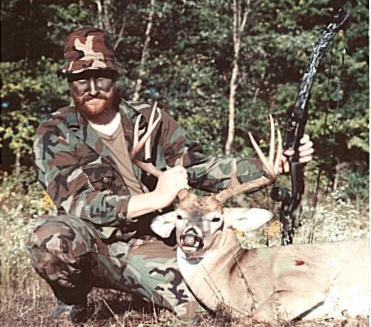 I hunted many more years with both gun and bow before taking a larger buck. Talk about beginners luck. He taped 118 7/8 P&Y Inches, and weighed 188 dressed. I was hunting alone, and had prepared for every eventuality except success :) Getting him field dressed and into the back of my wife's Honda Civic was a memorable chore.